China conducted a flight test of a new multi-warhead ballistic missile capable of reaching targets throughout the United States, Pentagon officials said. The test of the new DF-41 intercontinental ballistic missile, or ICBM, took place Dec. 4. The latest flight test demonstrated the use of two multiple independently-targetable reentry vehicles. The missile launch and dummy warheads were tracked by satellites to an impact range in western China. It was the second flight test this year of the new missile and the fifth since 2012. U.S. intelligence assessments suggest that the missile will be capable of carrying between three and 10 warheads. The two most recent missile flight tests took place Aug. 6, also with two dummy warheads, and on Dec. 13, 2014. Cmdr. Bill Urban, a Pentagon spokesman, declined to comment on the latest test. "We do not comment on specific PRC weapons tests, but we do monitor Chinese military modernization carefully," Urban said. The DF-41 is a road-mobile ICBM with a range of up to 7,456 miles. It is viewed by the Pentagon as China’s most significant new missile that has been in development since the early 2000s. Mark Stokes, a former Pentagon official specializing in Chinese military affairs now at the Project 2049 Institute, said that the DF-41 missile program appears to be in the advanced stage of research and development. "A reasonable speculation is that the system adapts a modified variant of the post-boost vehicle used on the DF-5B ICBM onto a new large diameter solid rocket motor," said Stokes. "Assuming final design certification, the missile system could enter the Second Artillery's operational inventory within the next five years." Rick Fisher, an expert on the Chinese military, said the test of two warheads indicates that Beijing may be seeking to mask the full warhead load of the new missile. 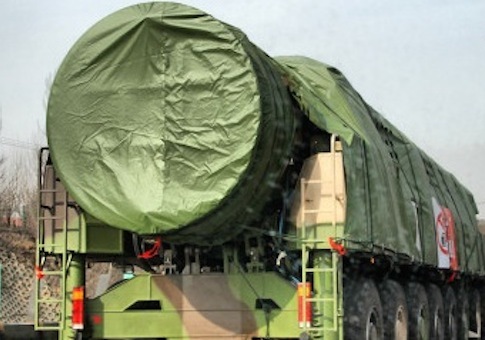 "It appears that China is pursuing a modest test schedule and the use of a low number of reentry vehicles may indicate a desire to conceal the full capability of the DF-41," he said. Fisher said testing the new missile with a small number of warheads allows Chinese missile engineers to expand the warheads’ trajectory. The test data can then be used in developing missiles with more warheads. Based on the robust testing schedule for the DF-41, China is expected to deploy the missile in the next two years, Fisher said. China obtained multiple-satellite launching technology from the United States during the 1990s through illicit space cooperation. The technology is believed to have formed the basis for the multiple warhead bus used on the DF-41. The Pentagon’s latest annual report on China’s military states that current DF-31 and DF-31A missiles can reach "most locations within the continental United States." The DF-41, however, will provide full coverage for nuclear strikes on the United States, defense officials said. China’s expansion of its current limited strategic missile forces into multiple warhead configurations marks a significant expansion of Beijing’s nuclear program. China is currently engaged in a large-scale nuclear forces build-up from its current warhead stockpile, currently estimated to be around 300 warheads. Outfitting its large force of strategic missiles with multiple warheads is likely to increase the number of warheads sharply. China’s long-range strategic missile forces currently include DF-31, DF-31A, DF-4, and DF-5 ground-based missiles, and JL-1 and new JL-2 submarine-launched missiles. A congressional commission on China in 2014 stated that "Despite the uncertainty surrounding China’s stockpiles of nuclear missiles and nuclear warheads, it is clear China’s nuclear forces over the next three to five years will expand considerably and become more lethal and survivable with the fielding of additional road-mobile nuclear missiles; as many as five JIN [missile submarines], each of which can carry 12 JL–2 submarine-launched ballistic missiles; and intercontinental ballistic missiles armed with multiple independently targetable reentry vehicles (MIRVs)." In a related development, a spokeswoman for Adm. Cecil Haney, commander of the U.S. Strategic Command, confirmed this week that China has begun operational patrols with nuclear missile submarines. Navy Capt. Pamela S. Kunze, the Stratcom spokeswoman, elaborated on comments by Adm. Cecil Haney, the Strategic Command commander, regarding the anticipated submarine patrols in a statement to the Washington Times. "Given China’s known capabilities and their efforts to develop a sea-based deterrent, in absence of indicators to the contrary, it is prudent to assume that patrols are occurring," she said. Haney said in October that while the Chinese have not announced the missile submarine patrols, some of the four Jin-class submarines have been seen this year. "So I have to look at it as operational capability today," Haney told reporters Oct. 22. China has not announced it is conducting nuclear-missile submarine patrols and U.S. intelligence agencies remain uncertain as to whether China has deployed nuclear-tipped JL-2 missiles on the Jin-class submarines.